Today marks the anniversary of the first x-Rays used in Medicine. The event occured on January 2oth 1896. 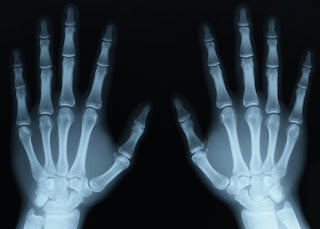 As with many scientific discoveries, x-Rays were discovered by accident. A year earlier, a German physicist named Wilhelm Roentgen made the discovery while experimenting with electron beams in a gas discharge tube. Roentgen noticed that a fluorescent screen in his lab started to glow when the electron beam was turned on. This response in itself wasn't so surprising - fluorescent material normally glows in reaction to electromagnetic radiation - but Roentgen's tube was surrounded by heavy black cardboard. Roentgen assumed this would have blocked most of the radiation. x-rays are basically the same thing as visible light rays. Both are wavelike forms of electromagnetic energy carried by particles called photons. The difference between x-rays and visible light rays is the energy level of the individual photons. The Science Blog - A top site!! Other Frog Blogs - But not as good!! Biology Prize - Last Chance to Enter.